Too many of the world’s citizens face impoverished living standards. The economic and financial crises have made matters worse. The viewpoint of Living Standards and Social Well-Being is that the fundamental objective for an economy is provisioning, not simply efficiency. 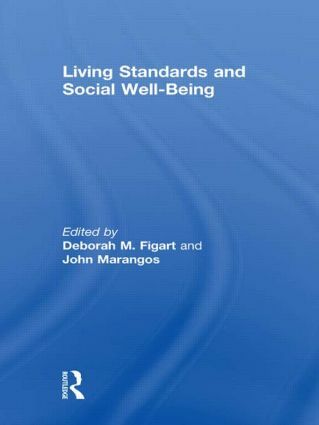 The chapters in this volume examine how economies across the globe come to understand what constitutes a living and how they can improve living standards, including balancing paid work with family life and civic responsibility. The authors provide historical, theoretical, and empirical studies of moving economies at the macro level and households at the micro level toward improved living standards. It is argued that achieving well-being and decent living standards, through work and welfare state policies, is a social responsibility. Such improvements could be delivered through basic income policies, family support, job guarantees, decent work, shorter work weeks, and support from social welfare. These issues are important for economics and the other social sciences and in particular for social economics. This book was published as a special issue of the Review of Social Economy. Deborah M. Figart is Professor of Education and Economics at The Richard Stockton College of New Jersey, USA. She is a former President of the Association for Social Economics and a widely published scholar on issues related to work and pay. She co-authored Living Wages, Equal Wages (2002). John Marangos is Associate Professor of Political Economy at the University of Crete, Greece. He is Editor of the Forum for Social Economics, a journal sponsored by the Association for Social Economics, and section editor for the Global Business and Economics Review. Focal points for John’s research include transition economies, international development, and innovative methodologies for teaching economics.